Your trusted source of information and inspiration since 2005. Make plans to not use the Esplanade between February 1st and April 1st. Earlier today we shared the good news: That PBOT will re-open Better Naito three months early. 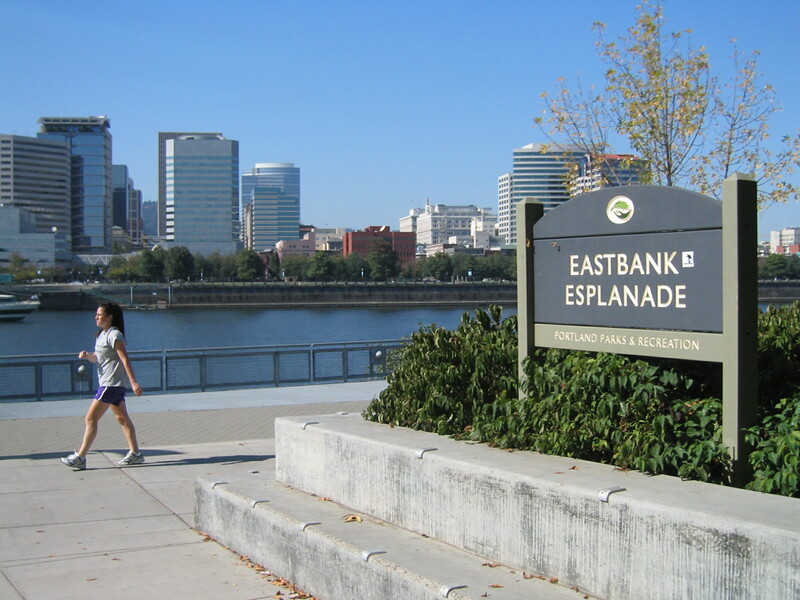 Here’s the bad news: They’re doing that because the Portland Parks and Recreation Bureau will close the Eastbank Esplanade for two months starting February 1st. Parks is working in partnership with PBOT, the Bureau of Environmental Services, and the Regional Arts and Culture Council on a major maintenance and repair project on the popular path. The closure will last until April 1st and the affected section will be from the Hawthorne to the Steel Bridge. This is an extremely popular path that PBOT estimates carries about 2,400 daily bicycle trips and 1,200 daily walking trips. “This long-planned project will improve safety and park amenities, replace invasive vegetation with native species, and restore our public art,” said Parks Commissioner Nick Fish in a statement released today. Among the improvements coming will be: replacement and repair of concrete, degraded surfaces, and various amenities, new and improved lights, and the cleaning of trash and graffiti. Two major events already planned — the Worst Day of the Year Ride (February 20th) and the Shamrock Run (March 17th) will be permitted to use the path during closure. As we shared earlier today (the rollout of this announcement wasn’t as smooth as I’d hoped because I was out of the office on-assignment most of the day), PBOT has stepped up to provide Better Naito to help with the detour. 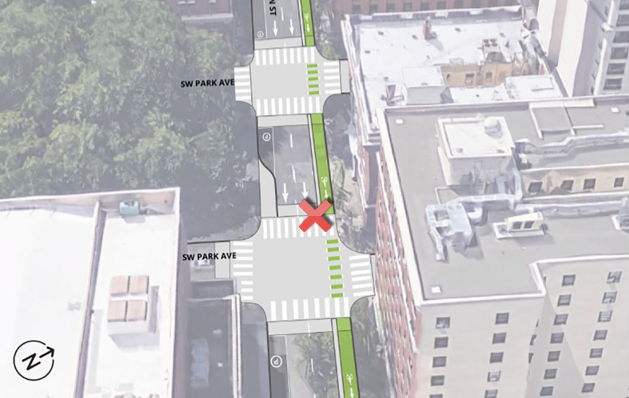 You’ll be able to start biking in the two-way protected path on Naito starting January 28th and it will stay up through the summer festival season. The project to restore this 1.5-mile section of the Esplanade to its original beauty is brought to you by $500,000 in the City’s 2018-19 adopted budget and $200,000 in ongoing maintenance funding. The post Get ready for a two month closure of the Esplanade that starts February 1st appeared first on BikePortland.org. The Portland Bureau of Transportation has found a way to bring back Better Naito sooner than anyone expected. The agency announced today that Naito Parkway will be upgraded with a protected lane for bicycling and walking from January 28th through the end of September. 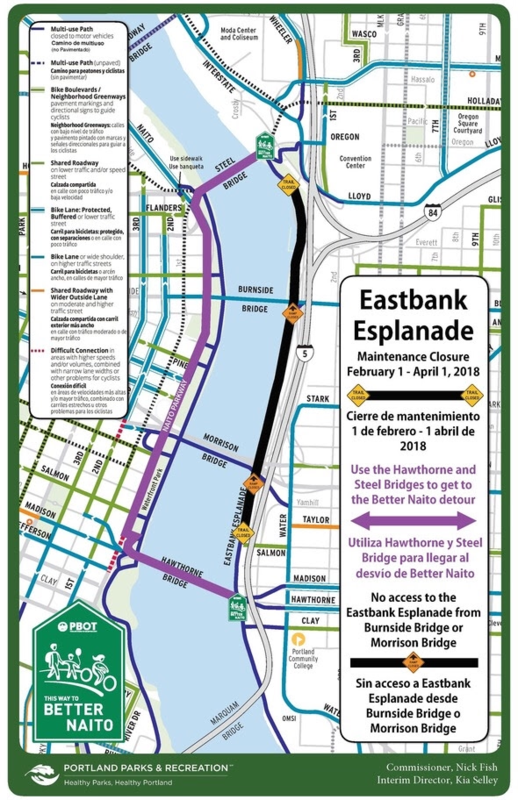 The early opening comes as the ever-opportunistic PBOT jumped on a chance to provide a safer and more comfortable detour for an upcoming closure of the Eastbank Esplanade. Portland Parks and Recreation will close the Esplanade between the Hawthorne and Steel bridges for two months beginning February 1st. The project will allow them to perform maintenance and repairs on the popular multi-use path. PBOT says in working with Parks to come up with viable detour, they decided Better Naito would be the best option. PBOT spokesperson Hannah Schafer told us this morning that instead of taking the posts and signage down after the Parks closure, they’ll simply keep it up through summer. This is a nod to Better Naito’s popularity and success in several years of a pilot project first sparked by tactical urbanist group Better Block PDX in 2015. PBOT is moving forward on a permanent Better Naito as outlined in the recently adopted Central City in Motion Plan (Project #17). Schafer said today that design work has started on the $4 million project that will include a two-way cycletrack and sidewalk along the west side of Waterfront Park. The public outreach process will start this spring (made much better by having Better Naito in place simultaneously!). PBOT still needs to find $1 million to build the CCIM project, but Schafer says they’re confident it will come through. See our latest post for more information on the Esplanade closure. The post PBOT: Better Naito will return three months early this year appeared first on BikePortland.org. This has gotten out of hand. Let’s catch the perpetrator(s). Enough is enough. Someone is deliberately throwing nails in a popular Portland bike lane and we’re tired of waiting for it to stop. So here’s the deal: BikePortland is offering a $500 $1,000 cash reward for information that leads to an arrest in this case. As we’ve reported, PBOT has reached out to Commissioner Chloe Eudaly’s office and the Portland Police Bureau for help. So far don’t have any leads — and given everything on their plate, we need to encourage them to make this a high priority. We need to treat this seriously. Intent to damage private property and hurt innocent people is a criminal act that we should not dismiss as a juvenile prank. If something like this targeted users of a freeway, you can bet the response from official authorities (and the media for that matter) would be much different. There’d be a manhunt underway and we’d have major engagement from all levels of law enforcement. We need to send a clear message that this is a serious crime and that it won’t be tolerated. *Thanks to KOIN-TV for interviewing me for this story. Someone in Oregon City is doing the same thing and police officers are offering a $1,000 reward for an arrest and prosecution in the case. In Portland we have thousands of people using bike lanes every day and we have a long and proud legacy of respect for cycling. We should do at least as much about this as Oregon City. It’s time for our law enforcement agencies to step up. Crimestoppers of Oregon offers rewards for all types of crimes. We hope they’ll join us and work with the PPB to help raise the profile of these incidents until someone is caught. We’d also like to see Commissioner Eudaly and/or Mayor Wheeler make a more formal public statement to put our community on notice that bicycle riders deserve respect and that behavior like this will not be ignored. Thanks to all of you who’ve pledged to make a financial contribution to BikePortland to help make this reward offer possible. We don’t have the funds to do this. My hope is that once someone’s caught, we can raise the necessary funds from the community. We’ll increase the reward amount if we raise more than $500. When you find nails in bike lanes, please report it to PBOT maintenance dispatch (503-823-1700 or email pdxroads@portlandoregon.gov) and tag @BikePortland, @PBOTinfo and @ChloeEudalyPDX on Twitter. If you see someone spreading them, or have any evidence about the possible suspect, please come forward and call it in to either 911 (if it’s in progress) or the PPB’s non-emergency line at (503) 823-3333. What else can we do to stop this from happening? UPDATE, 4:43pm: An anonymous donor has come forward to match our reward, bringing it up to $1,000. The post Want $1,000? Help us solve the mystery of nails in the Interstate Ave bike lane appeared first on BikePortland.org. Where will you ride this weekend? If you can get over the creeping unease about climate change-induced weird weather, you can relax and enjoy this mild winter we’re having. It should be dry and maybe even sunny this weekend. And as luck would have it, there are plenty of great rides and events to choose from. A very nice group has been showing up to this weekly ride. With friendly faces and our mild weather, this is a great way to motivate yourself to keep riding through winter. More info here. This small but mighty group of volunteer activists did great things in 2018. Now they want you to join them for a strategy and visioning session to make 2019 bigger and better. Bring your big ideas and a willingness to make them happen.More info here. Our statewide cycling event sanctioning body will host an evening at the Chris King cafe for a bit of work, play, and recognition of the year’s best racing teams and athletes. More info here. Led by PWTC member Ann Morrow, this leisurely “4 Path Loop” ride aims to acquaint you with some of the main bike routes in the city. More info here. Keep your legs and skills sharp and connect with a community of riders at this “spirited” weekly ride. 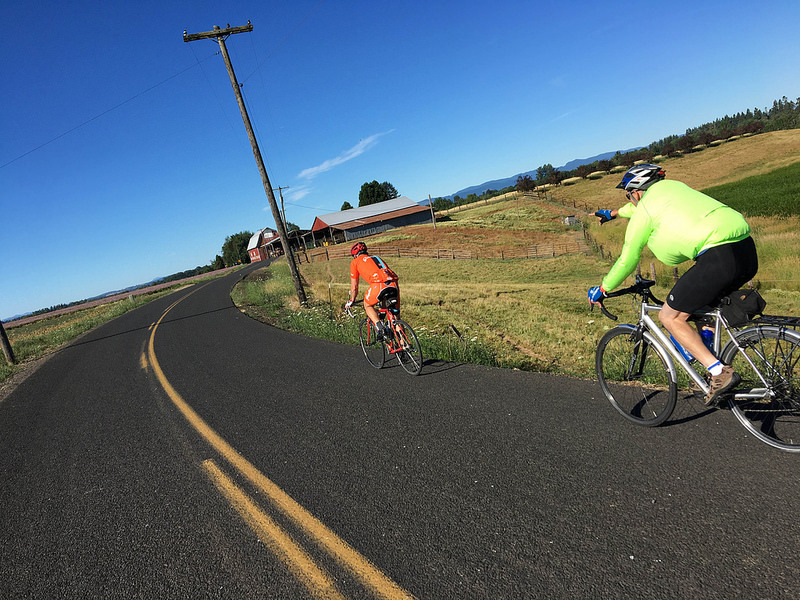 This is an intermediate-advanced group ride with a route that includes hot-spot sprints and goes around Sauvie Island and up through the West Hills. More info here. Our Mother the Mountain, their legendary gravel rides, and their Unpaved email list, have spawned a robust and engaged community of riders. This event is a chance to come together and socialize without an epic ride getting in the way. Expect a fun, industrial alley-cat type ride to keep things interesting; but mostly this is about hanging-out at the bike shop to meet people and learn about their lives and their bikes. More info here. Corvidae (scientific name for crows and ravens) is a welcoming group of people who like riding bikes and exploring the streets of Portland together. This month’s ride ends at Fire on the Mountain to sample spicy chicken wings! More info here. The post The Weekend Guide: Gravel social, activism inspiration, OBRA awards party, and more appeared first on BikePortland.org. In the early morning hours of August 21st, 2017, Paul Thompson was on his usual route picking up recycled cardboard from businesses in Portland’s central eastside industrial district. A truck driver for over three decades, Thompson had a spotless record before that morning. After a stop to empty the bins at All Service Moving on Southeast Morrison, he drove south on Water Avenue. Then he turned left onto Taylor and his life changed forever. In that intersection Thompson and his truck collided with 41-year-old Tamar Monhait, who was bicycling north on Water. She died from the impact. Thompson’s truck just moments after the collision. In October 2018 I got an email from Thompson. He wanted to talk and share his side of the story. 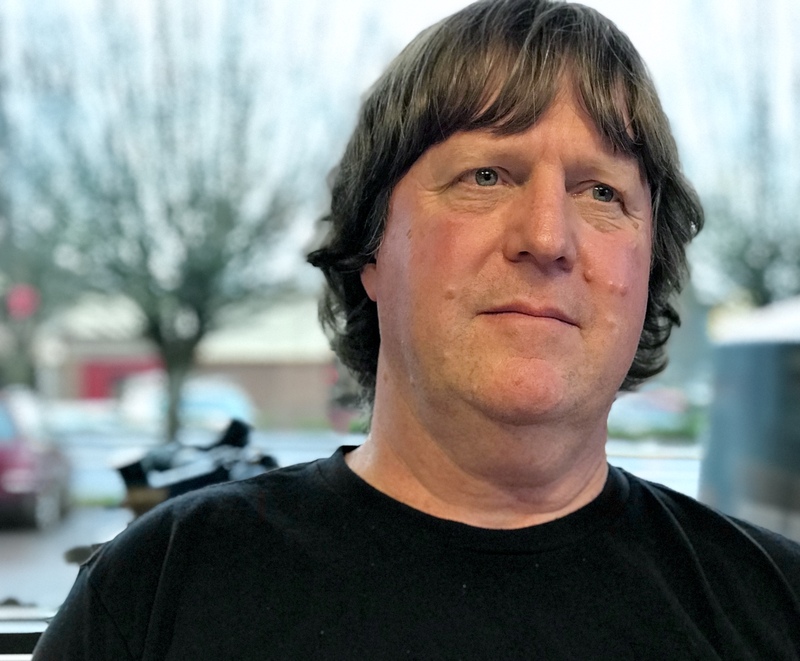 I met him yesterday at the Burgerville on Southeast 122nd near Parkrose High School, just a couple miles from his home in the Wilkes neighborhood of east Portland. As Thompson shared his story he oscillated between a warm smile (he’s a jovial guy) and a voice that quivered with regret as his face fought away tears during heart-wrenching recollections. “There are some things I probably did wrong,” he recalled, as he stared out into the grey January rain. Throughout our conversation I could tell he fully accepted his role in what happened. He said would have never been at that intersection at that time on August 21st if it wasn’t for the total solar eclipse. He started his route early that day with hopes of getting home in time to snap photos of it. A fan of astronomy-related conspiracy theories and an avid listener to Coast to Coast, a popular radio talk show that covers them, Thompson said he was excited to see the eclipse. But it’s what he didn’t see in the darkness that morning that haunts him to this day. It didn’t help. Monhait’s head struck the front of his truck and she died shortly thereafter. Thompson remembers getting out of his truck and going to her side as she lay on the street. Then he started talking to her. This site relies on financial support from readers like you. Please subscribe or donate today! Thompson, now 56, was born in Nebraska. His father moved the family to Oregon when he was four. He has two kids, an 18-year-old son and 15-year-old daughter. He started driving garbage trucks in 1980 and used to have a route in the West Hills above Portland. He worked his way up to operations manager at one point, then realized management wasn’t for him and went back to being a driver. Thompson didn’t end up in jail. In the end he was charged with one traffic ticket for making a dangerous left turn (his lawyers got the failure to use a turn signal citation dismissed). The Multnomah County District Attorney declined to pursue a criminal case and he was never charged with Careless Driving so the Vulnerable Roadway User law — which would have given him a $12,500 fine, suspended license, and/or community service — wasn’t triggered. A lawsuit filed by Monhait’s family was settled out of court. Republic allowed Thompson to come back to work a few months later; but not as a driver. He says they fired him unjustly in January 2018. “I think they just wanted to get rid of me,” he said. Getting fired meant he was unable to collect unemployment benefits. Thompson had trouble making ends meet before getting a job at another trash-hauling company, making substantially less per hour than he made at Republic. Before parting ways Thompson and I talked about how he could help improve road safety by becoming an advocate and speaking out to more people about his experience. He said he’d be willing to do that. Trucks like his claim far too many lives in Portland and we must do more to prevent a tragedy like this from happening again. 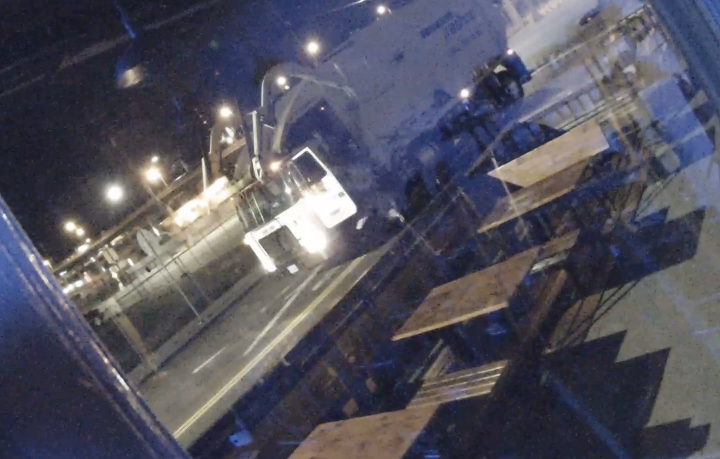 The post Truck driver Paul Thompson wants you to know he’s sorry for role in deadly crash appeared first on BikePortland.org. *N Willamette greenway route on the left, HOP greenway route on the right. 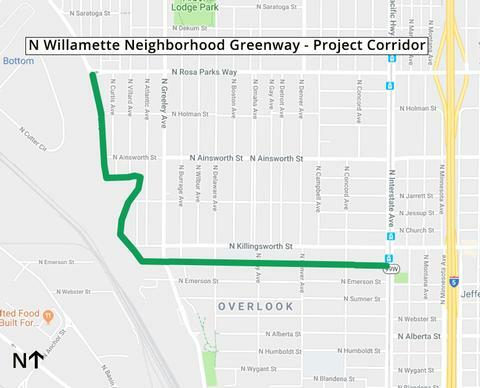 While the Portland Bureau of Transportation looks to continue the positive trends of 2018 with projects on high crash streets, they haven’t forgotten about neighborhood greenways. This week City Council approved $1.2 million in funding for a low-stress route between NE 128th and the Gateway Transit Center in east Portland. 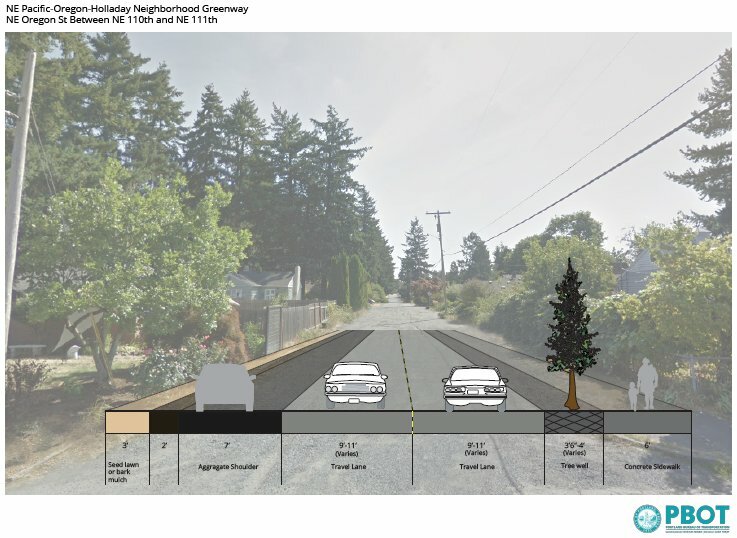 And late last month PBOT visited the Arbor Lodge neighborhood to pitch their proposal for a new neighborhood greenway on North Willamette Blvd between Interstate and Rosa Parks Way. The east Portland project is known as the HOP Neighborhood Greenway because it uses Holladay, Oregon, and Pacific streets to give bicycle riders a more pleasant option than the fast and stressful arterials of Glisan and Halsey. The project will include the usual trimmings of a street where cycling and walking are prioritized over driving: sharrow markings, special signage, a 20 mph speed limit, fewer stop signs, more street trees, speed bumps, and so on. In addition, PBOT says they plan to improve the crossing at the intersections of NE Pacific and 102nd and at NE Holladay and 122nd. There are also two sections of the HOP route that are currently “unimproved” (gravel) roads where PBOT has significant upgrades planned. Construction on the HOP greenway is scheduled to start sometime this year. PBOT installed a diverter at the Willamette/Greeley intersection back in May. Willamette Blvd in north Portland is already a de facto bikeway. Many people use it as an alternate to busy, stressful conditions on Interstate Ave and Rosa Parks. It’s also a nice shortcut if you’re riding between downtown and University Park/St. Johns. Unfortunately as the amount of drivers in this area has increased, many of them cut-through neighborhood streets in this area. You might recall this issue coming up in our stories about people who vandalized “20 is Plenty” signs on N Villard. Cover of plan for Willamette Blvd created by PSU Masters students. The city can hit the ground running on this project in part because Willamette Blvd has already been the focus of plans by neighborhood advocates and a group of Portland State University urban planning students. 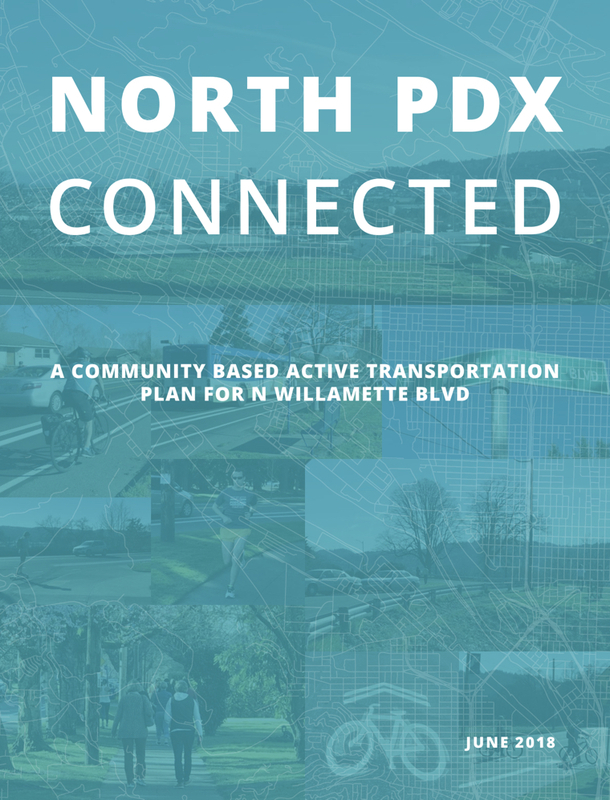 North PDX Connected: A Community Based Active Transportation Plan for N Willamette Blvd (PDF) is the title of a project published in June 2018 that included many recommendations on how to improve the street. Back in October we reported that the city has $68,000 already set-aside for this project. PBOT plans to do outreach on this project in the coming weeks and months, then test potential changes in March. Final plans are due to be completed by this spring with construction in the summer of this year. See the official project page here. The post City moves forward with neighborhood greenway projects in north, east Portland appeared first on BikePortland.org. 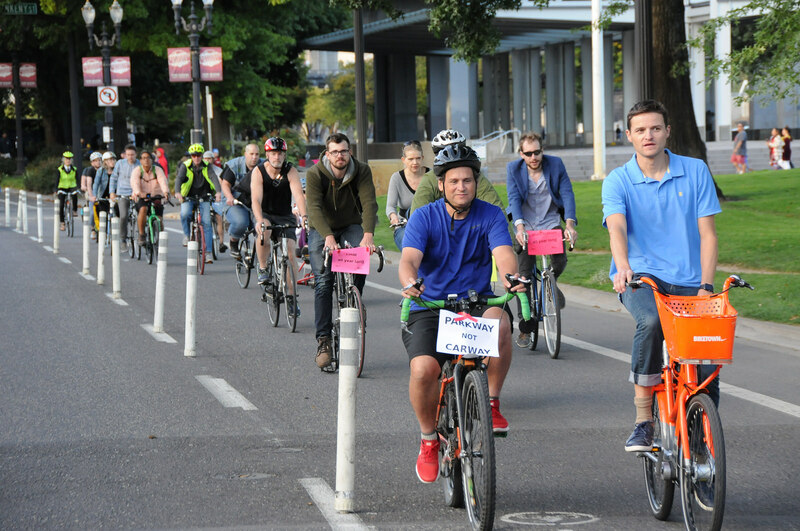 Portland has adopted goals to reduce carbon emissions by 80 percent (Climate Action Plan), make 70 percent of trips by something other than driving alone (Comprehensive Plan), and reach a 25 percent cycling usage rate (Transportation System Plan) by 2035. To reach these goals we must have ample, accessible, and secure bicycle parking available citywide. And it was with these goals in mind that the City of Portland embarked on their Bicycle Parking Code Update project in 2016. Our existing code hasn’t had a wholesale update since 1996 when about 200,000 fewer people lived here and our official bicycle commute mode split was a measly 1.2 percent (it’s at around 7 percent today). But the city’s proposals have run up against concerns from real estate developers and our local chamber of commerce. Companies and organizations that construct housing and office buildings worry they’ll lose money if they devote too much space to bicycle parking. Precious square footage in Portland’s hot real estate market can be put to more valuable use, they argue, as retail space or more housing units. The Portland Business Alliance echoes those concerns and says current bicycling rates are so low they don’t even merit the need for more bike parking. At the heart of the code update is an increase in the number of long (employee) and short-term (visitor) spaces new buildings will be required to have. The new policy brings the minimum amount of spaces for a residential building to 1.5 per unit (up from 1) and 1 space per 1,800 square feet for office buildings in the central city (there are two geographic tiers based on different cycling mode split expectations). Several proposals didn’t make it into the final draft of changes. A requirement for electrical outlets to charge e-bikes was passed over after staff realized it fit better in the building code instead of the zoning code and there’s also a chance it could be included in an upcoming city effort to improve EV charging. You can see a one-page summary of the proposed changes here (PDF). The most contentious aspects of the city’s proposal have to do with “in-unit” requirements and affordable housing. The current code allows developers to put all the required bike parking inside the dwelling unit. During their outreach process, PBOT learned that some builders would simply stick a cheap hook next to bed or in a crowded corner to meet the requirement. And some residents complained about losing their damage deposits after bringing wet, greasy bikes into rooms. Blue is what current code requires, red is new proposal. 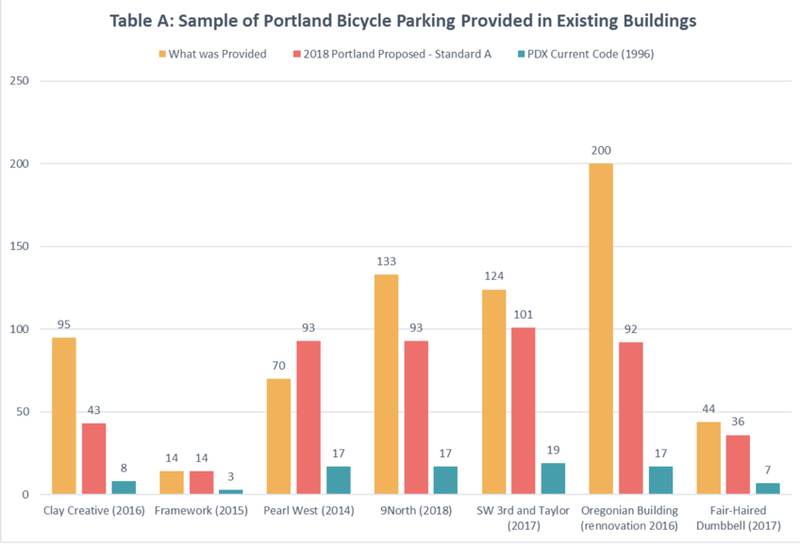 With support from the 2030 Bike Plan, which recommended prohibiting in-unit residential bike parking altogether, PBOT initially proposed that none of the required, long-term parking could be provided within a unit. But according to the proposed draft, PBOT staff “heard loud and clear from the development community” that this policy was untenable. If developers are forced to use square footage outside units for bike parking they say they’ll lose money that could otherwise be earned from having more retail or residential space. 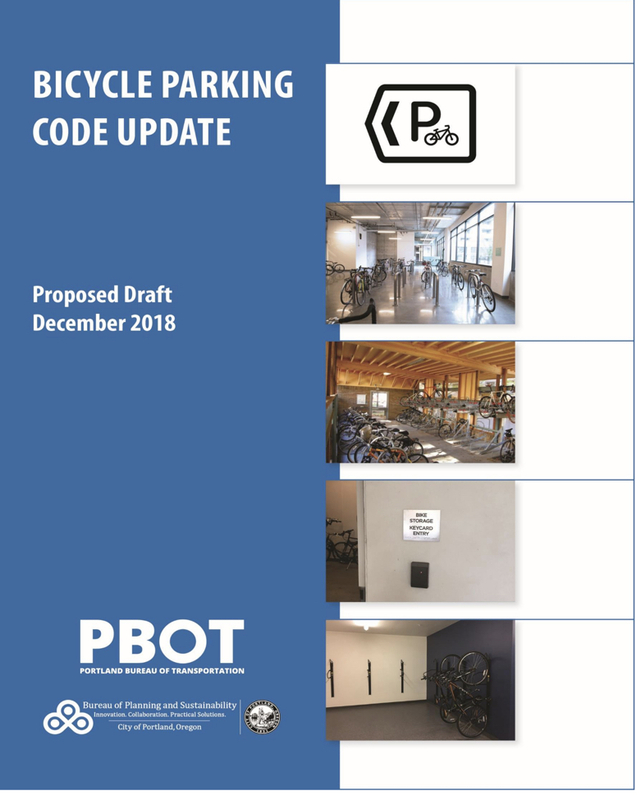 PBOT and the Bureau of Planning and Sustainability conducted a “Bicycle Parking Spatial and Economic Study” (in a memo you can find on page 64 of this PDF) that found the proposed bike parking requirement scenarios could result in a decrease in net operating income of between 1 and 4 percent. Then affordable housing advocates and companies got wind of the proposal. They worried that the mandate for 80 percent of long-term parking to be outside the unit would result in fewer housing units being built and — because of the more stringent regulations they work under — could even jeopardize entire projects. PBOT has reacted to that need by carving out an exemption. The latest proposal says up to 50 percent of the spaces in an affordable housing development can be in-unit. And for sites with 10 units or less, all of the required long-term spaces can be inside the unit. This backpedal has raised eyebrows of several PSC members. Commissioner Chris Smith sees a clear line between quality bike parking and our mode share goals. “It’s not sufficient to just build bikeways, we also have to have end-of-trip facilities,” he said during yesterday’s meeting. He called the current in-unit bike parking policy a “strange artifact of our code” that we should have axed in the 1990s. Smith thinks in-unit bike parking doesn’t encourage cycling and he wants city policy to strongly discourage developers from providing it. “What we’re doing is reducing our requirements by 20 percent and saying you only have to build 80 percent of what’s needed to reach our goals,” he said. Schultz and the rest of the PSC is likely to hear more from developers and business interests when the Bike Parking Code Update is back in front of them for a public hearing on January 22nd. The post Showdown looms for major bike parking policy update appeared first on BikePortland.org. It’s taken years of complaints but it seems we’ve finally the attention of city officials on a recurring bike lane safety issue that might have a malicious origin. The case of nails being strewn in the bike lane on North Interstate Avenue has gone unsolved for years. Now the police and a city commissioner are on the case. We first reported about this in March 2017, but that wasn’t when the problem started. A quick search of Twitter posts shows that complaints go back to 2012. Someone tagged the Portland Bureau of Transportation with a complaint about it in September 2016 (who then forwarded it to the maintenance department). In January 2018, the issue received its own Twitter account when @InterstateNails was born. 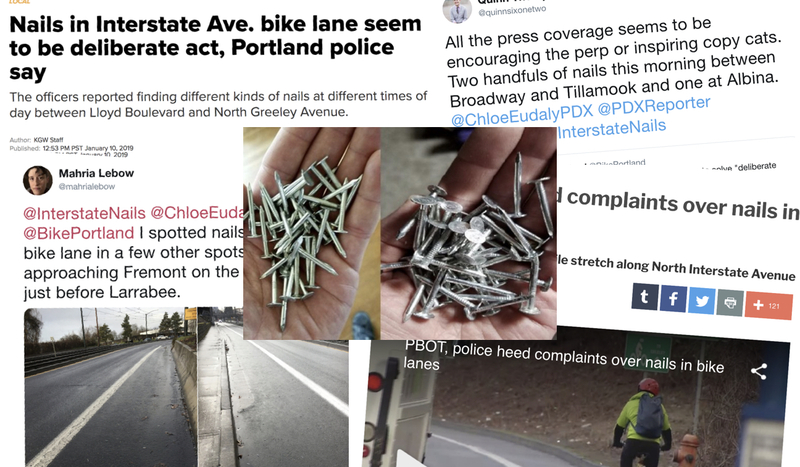 With several nail incidents at the end of last year, KATU-TV reporter (and daily bicycle rider) Reed Andrews gave the issue much-needed visibility. After the most recent frustrating flare-up in flats, we heard from a staffer in PBOT Commissioner Chloe Eudaly’s office. Margaux Weeke wanted us to know the issue was on their radar and that they’d reached out to PBOT and the Portland Police Bureau to ask about how/if it was being managed. “The problem isn’t falling on deaf ears,” Weeke promised. Notes from the PPB investigation also say days and times the nails appear are random and that they’ve noted a variety of types including roofing and framing nails. Their investigation into this issue is still in progress and hasn’t yielded major clues at this point. While the problem still isn’t solved, it’s good to know that at least City Hall, the PPB, and PBOT are working together on this. We’ll keep you posted if they make any breakthroughs. In the meantime, please tag us on Twitter if you find any nails. The post Commish Eudaly’s office works with police to solve “deliberate act” of nails in Interstate Ave bike lanes appeared first on BikePortland.org. Storytime! 2nd and 4th Mondays of the month January-March. I’m still chugging away at trying to pedal more throughout the winter in an attempt to keep my winter blahs at bay, but I’ve decided to supplement things with some indoor bike-related fun for the off-season. 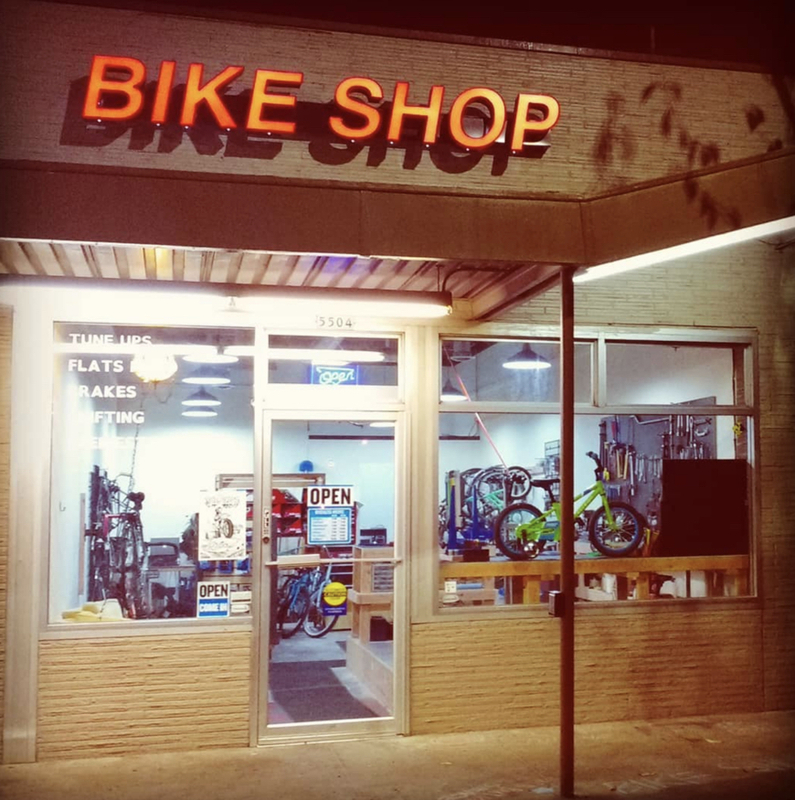 Enter Bike Shop Storytime. Wearing our hats as Kidical Mass co-organizers, Sara Davidson and I will read bike-related stories (and probably some non-bike-related stories) selected for us by Katie Proctor, a veteran family biker, Kidical Mass co-founder, and owner of Books with Pictures, an inclusive comics shop. The storytime will be followed by a Q & A session about biking as a family. I’ll also have a small supply of the books we’ve read for sale (cash only) from Books with Pictures. And since I need to bring the books back to the comics shop after the event, there’s an optional bike ride, too! I’ll be taking the most family-friendly route between Clever Cycles and Books with Pictures (here’s the route) and will happily coordinate leading folks back to the bike shop after a quick visit. Families interested in taking the bike ride, but without wheels of their own can show up a bit early to borrow a bike from Clever Cycles — there are a few bakfietsen (front-loading cargo bikes, like the one in the illustration) and longtails (rear space for kids) available to use. I hope the event will continue past the slow season when we tend to hold few, if any, Kidical Mass bike rides, and we welcome any feedback in the comments about changing up the time or days to better accommodate more storytime fans. Thanks for reading. * Thank you to Liz Holladay from Clever Cycles for the bike-riding book illustration and to Leslie Hickey of Hoarfrost Press for the graphic lettering. The post Family Biking: Join us for a new ‘Storytime’ event series appeared first on BikePortland.org. If you’ve missed electric scooters in Portland, you’ll be happy to hear they’ll start popping up again soon. Sort of. While we don’t have any dates for another deployment, scooters will be back in the news as the City of Portland Bureau of Transportation releases its full report on the four-month pilot program next week. That’s good timing for officials in Salem who are getting lobbied hard by Bird, a major scooter company and one of the three who participated in the Portland pilot. Salem planners will have plenty of data and analysis to pore over as they consider scooter prospects in the capital. A story published today in the Statesman Journal reports that Bird executives have already bent the ear of Salem Mayor Chuck Bennett and city staff are likely to meet with the company soon to get their full pitch. That same story mentions the Portland pilot and confirms that PBOT plans to release a full report on it next week. 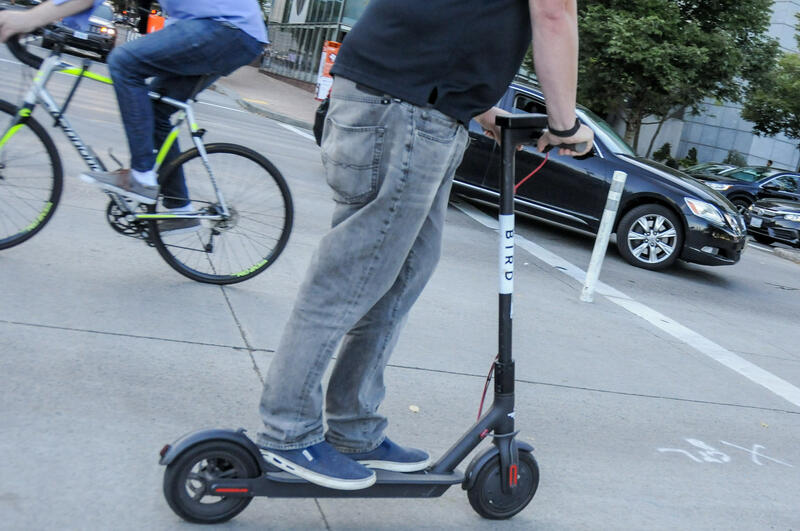 Given the existing survey data and PBOT’s general tone about scooters, my hunch is the report will provide even more momentum for a second deployment. And if scooters do get the green light in Salem, imagine the impact that could have on the minds of state legislators. A successful and high-profile deployment around the capital might help lawmakers see beyond the automobile when it comes to transportation policy. If the future is anything like the past, scooters have a bright one in Portland. Back in October, the City of Portland released a survey of scooter riders — 85 percent of whom said they’d be “extremely” or “very likely” to recommend them to a friend. The post Scooters back in the news: Bird in Salem and Portland as final report coming soon appeared first on BikePortland.org. Auto users will get about 45 feet of space on Greeley. Bicycle users will get 12 feet. A concrete jersey barrier will separate them from each other. 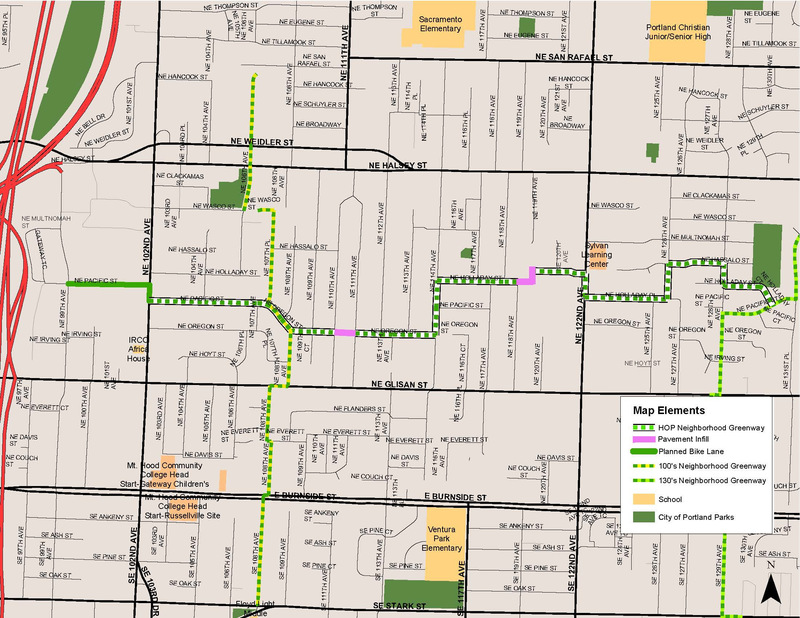 At long last the construction of a new bikeway on North Greeley Avenue is imminent. At least we hope it is. At their meeting this week Portland City Council is poised to authorize a contract for the construction of the Greeley Multi-Use Path project. This change to a notoriously dangerous yet extremely vital link between the central city and north Portland was first slated to be completed in spring 2017. Then it was pushed back a year due to what the city’s transportation bureau said was a glitch in state contracting laws, only to be delayed once again last summer when PBOT says they ran out of time to get a quality bid. Now PBOT says the $1.9 million project will go to construction this summer and will take about 4-6 months to build. 95% design plans by PBOT. 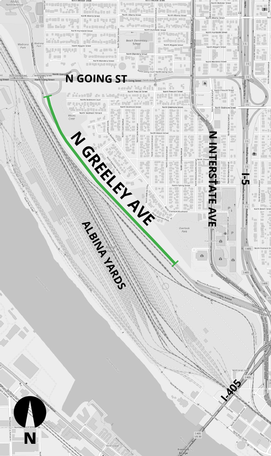 As we’ve reported, the design will be a two-way physically protected path on the east side of Greeley that will connect with the existing path that connects to North Interstate Avenue on the south end. Northbound Greeley users won’t notice much change in their route (except for others coming toward them in the opposite direction); but southbound users will notice a big change. South of Going Street, the plans call for a new bike signal, signage, and pavement markings that will direct bicycle riders from the west side of Greeley, across the intersection to the east side where the new path will begin. The path itself will vary between 11.5 to 12-feet wide. It will have a two-foot wide buffer filled with a concrete wall, a.k.a. jersey barrier. It will be interesting to see how this new path works. For comparison, it will be a similar width as Better Naito, another protected, two-way facility. But unlike Naito, Greeley is a very loud and stressful street where auto and large truck drivers will be flying by at 45-50 mph. Downhill cycling speeds are also an “x” factor in how the new, two-way design will work. Even will these concerns however, it’s likely to be a significant improvement over the freeway on-ramp roulette we’ve been dealing with all these years. Funds for its construction come from a $650,000 allocation from the city’s Heavy Vehicle Use Tax (the project was endorsed by the city’s Freight Advisory Committee), $600,000 in maintenance funds set-aside by City Council, and $600,000 from ODOT’s House Bill 2017. In related news, a pending lawsuit accusing PBOT of negligence for cycling conditions on Greeley is moving forward. Lawyers for the plaintiff, Robert Smith, say they’re in the discovery and deposition phase of the case and they’ve received answers from their inquiries from the PBOT, the Oregon Department of Transportation, and Brandon Swiger (the man who hit Smith with his car in December 2017). View full 95% design plans here. 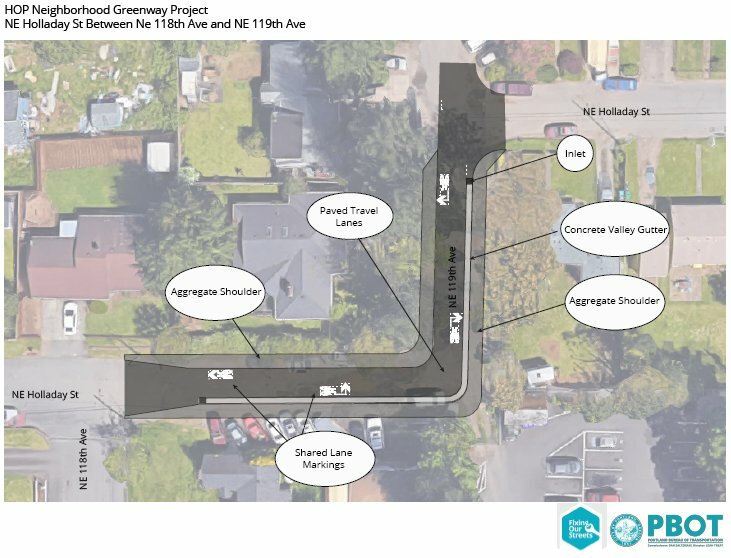 The post PBOT says Greeley Ave bikeway will be built this summer appeared first on BikePortland.org. This three-wheeled handcycle isn’t allowed on MAX trains. Last month we shared the story of activists who spoke out at a TriMet board meeting about their desire to take adult tricycles on light rail cars. Current TriMet policy allows only two-wheeled bicycles on MAX. Portlander Serenity Ebert, one of the people who testified at the TriMet meeting, uses a trike as a mobility device and she’s pushing the agency to change its policy so that she and others can have the same access as other bicycle users. “Any specific request would be need to be fully investigated on its own merit. That said, I can tell you that if Ms. Ebert was not able to use her walker, her request to use the tricycle as a mobility device would still be denied right now because that violates current policy. The Federal Transportation [sic] Administration currently uses tricycles (and bicycles) as a specific example of a ‘device not primarily designed to assist individuals with mobility impairments’. The post TriMet says denial of tricycle as mobility device is supported by federal regulations appeared first on BikePortland.org. Netherlands bike lane problem: The Guardian reports on a chaotic mix of e-bikes and other types of micro-vehicles that are causing confusion and major safety issues in the legendary bikeways of Amsterdam. Buried in that story is a startling rise in e-biking deaths. A “bicycle beltway”: I love how D.C. is talking about cycling in the same way they talk about driving. That’s how you change the status quo. And guess what? It’s inspired largely by the success of their bike share program. End RTOR: More good things from D.C.: They plan to end right-turn-on-red at 100 intersections this year. The law that emerged in the 1970s as a gas-saving measure is falling out of favor because of dangers posed by right-turning drivers. Power of bikes: The East Side Riders Bicycle Club is helping keep kids in Watts, California stay away from gangs and other bad stuff. Don’t penalize, subsidize! : A large city in Italy plans to pay people to ride bikes and will even subsidize their purchase of a new bike. Take that all you supporters of Oregon’s absurd $15 bike tax! Hello, Oregon legislators. Anyone home? : A report from the state-appointed Global Warming Commission says greenhouse gas emissions are on the rise in Oregon primarily because people are driving too much. Rep. Power gets it: Oregon House Rep. Karin Power who represents parts of southeast Portland and Clackamas County, shared an opinion in The Oregonian about the urgency of passing laws in 2019 that will limit the impacts of climate change. Oslo ups the ante: “We’re doing this to give the streets back to the people,” says Oslo’s vice mayor for urban development in a NY Times report on their plan to remove all auto parking spaces from the city center. Florida’s bad behavior: The “Panhandle State” is statistically the most dangerous place to ride bikes — and the local experts say it’s largely because of a traffic culture that only respects driving. 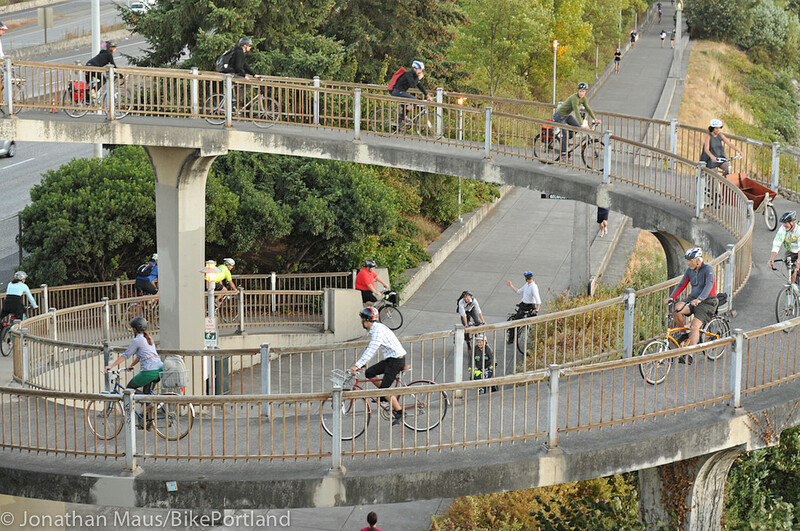 Portland is off-the-back: Our once-leading bicycle city is glaringly absent from the People for Bikes list of 10 best new bikeways of 2018. We’re growing fast: Since 1990 the population of the Portland metro area has grown by 61 percent, or 929,000 people! See how that compares to other cities in this tweet from Michael Andersen. The post The Monday Roundup: Chaos in utopia, a ‘bicycle beltway’, Oslo’s big move, and more appeared first on BikePortland.org. Movie poster from Universal Pictures. “Evil has many forms, now it returns as, The Car. A car possessed. Who knows what it wants? They all know nothing can stop… The Car. There’s nowhere to turn, nowhere to hide. No way to stop, The Car. Happy Friday everyone! It’s good to be back in the swing of things after the holiday. I hope your new year is living up to the hype so far. Isn’t that amazing? Meant as a cheesy horror film, this thing gives me all sorts of chills — especially in today’s world of zombie-like distracted drivers and AVs. I didn’t watch the entire film, but the Wikipedia page says one scene depicts the demonic Lincoln Continental Mark III taking out two innocent bicycle riders trying to pedal across a high bridge. And yes, I’ve already sent it to our friends at The War On Cars Podcast. Try not to have nightmares! See you back here Monday morning. The post “The Car” movie has the scariest trailer I’ve ever seen appeared first on BikePortland.org. We’ve had five great job opportunities posted since just before the holiday break. Get to ’em while they’re still fresh! The post Jobs of the Week: Castelli, Sellwood Cycle Repair, Community Cycling Center, Left Coast Bicycles Mobile Shop appeared first on BikePortland.org. An Oregon state legislator wants to clarify his position on a controversial plan to build a bridge for bikers and walkers over rail tracks in southeast Portland. TriMet concept drawing of the overcrossing. Koerner Camera Systems is in upper left. After being informed by TriMet that they’d lose federal funding if the Gideon Overcrossing doesn’t get built on SE 14th as currently planned, Representative Rob Nosse says he supports that location — despite major concerns voiced by adjacent business owners. As we’ve reported, Nosse wrote a letter to TriMet and the City of Portland on December 10th (PDF) asking them to consider moving the bridge to a different location. “I don’t think your planning is so far along that you could not consider an alternative,” Nosse wrote, after meeting with owners of Koerner Camera Systems, Sustainable Northwest Wood, and K&F Coffee. Nosse also felt that moving the bridge would be an “appropriate compromise” given the opposition. Led by Michael Koerner of Koerner Camera Systems, businesses on 14th Avenue including Rapid Bind, Cascade Commercial Real Estate, and Dovydenas Winery, have organized against this project based on how they perceive the presence of a bridge — especially one that would cater solely to walkers and bikers — would impact public safety and access to their properties. Koerner has hired a land-use attorney who made a request for additional environmental review to the regional head of the Federal Transit Administration last month. “I wrote a letter to Tri-Met and PBOT asking if the pedestrian bridge could be moved to 16th street or even 8th street, thinking that this kind of compromise would help Mr. Koerner and his business and still allow for the bridge to be built. Since then, I have been informed by Tri-Met and PBOT that moving the bridge to a different location will result in the withholding of the money that the Federal Government is granting for the bridge project. In short, if we move the bridge there will be no money to build the bridge at all. If the choice is a bridge that utilizes 14th Avenue or no bridge at all, I would of course support the bridge being built at the 14th street location. Hopefully it can be built/designed in a way that does not hurt Koerner Camera’s business. Meanwhile, the Southeast Uplift Neighborhood Coalition has written a letter (PDF) to PBOT Commissioner Chloe Eudaly urging her to approve the project “as soon as possible.” They say the business owners’ concerns can be mitigated and that further delays risks losing out on $15 million in federal funding. To hear from other business owners and learn more about this project, don’t miss the robust discussion in the comment section of our previous post. The post State Rep Rob Nosse says he supports Gideon Overcrossing at 14th Avenue appeared first on BikePortland.org. This morning someone died while walking across a street in downtown Portland. It’s the first traffic fatality of 2019. A project approved by City Council in November might have prevented it. According to the Portland Police Bureau, the collision happened just after 7:00 am this morning at the intersection of SW Salmon and Park, just across from Arlene Schnitzer Concert Hall and the Park Blocks, in an area known as the center of our downtown theater and cultural district. 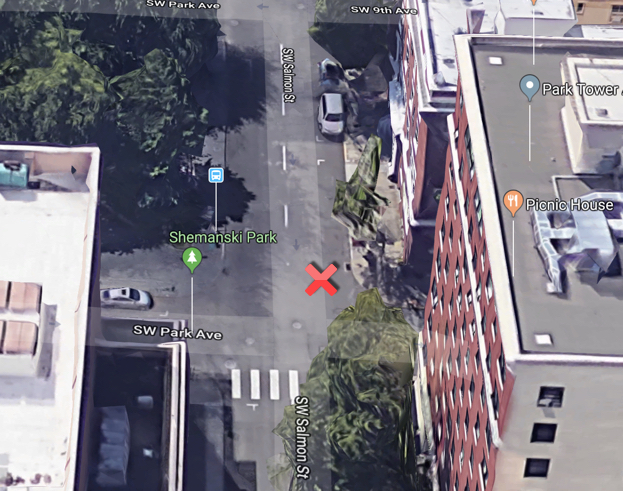 “Based on preliminary information,” the police statement reads, “investigators believe the pedestrian was crossing Southwest Salmon Street in an unmarked crosswalk when he was struck by a vehicle that was traveling on Southwest Salmon Street.” The man suffered major injuries and died shortly after at a nearby hospital. This is a tragedy for our city; not just because we’ve lost another person to traffic violence, but because a project that’s already been planned, designed, and funded could very likely have prevented the death. Streetview looking east on Salmon and Park with “X” where driver’s car was stopped after the collision. In November, council approved the Portland Bureau of Transportation’s Central City in Motion plan. That plan aims to improve downtown streets by making them safer and more efficient for all users. 18 projects were included in the plan, with eight of them slated for implementation in the first 1-5 years. PBOT has around $25 million already in place to start building them. Raised intersection as depicted in the NACTO Urban Street Design Guide. What’s often lost in debates about projects that include protected bike lanes is — especially in Portland — they rarely come with only cycling-related upgrades. In this case, the intersection where the man was hit and killed this morning is slated to be improved for everyone. The project comes with a new bus stop, a protected bike lane, extended curbs to decrease the crossing distance, and fewer on-street auto parking spaces to improve sightlines at the intersections (the space where that big red van is parked in the streetview image above would be a bicycle lane). Right now only one crossing of Salmon at SW Park is striped with a crosswalk. Preliminary reports say this morning’s victim was using the side of the street that doesn’t have one. In Oregon we’re told that “every corner is a crosswalk,” and while existing statute might not be so clear (ORS 801.220 says, “Whenever marked crosswalks have been indicated, such crosswalks and no other shall be deemed lawful across such roadway at that intersection”), the onus for safety should always be on the person with most potential to do harm. PBOT cross-section proposed for Project #8 in Central City in Motion plan. This morning’s death is a stark reminder that the current condition of our downtown streets is unacceptable. They are a ticking time bomb that we should treat with similar urgency. When streets are dominated by drivers and cars, drivers and cars will dominate. We can’t implement these Central City in Motion projects soon enough. And we need to plan even more of them. Portlanders deserve a safe and inviting downtown where driving is discouraged and demoted, and where a foot on pavement is more powerful than a foot on a gas pedal. The post A planned and funded project could have prevented this morning’s fatal collision appeared first on BikePortland.org. Mark your calendars, and start training! In its 32nd year of existence, the venerable Cycle Oregon is evolving once again. In recent years, the nonprofit known for its week-long “Classic” ride, has added women-only and gravel events to broaden its appeal and accessibility. 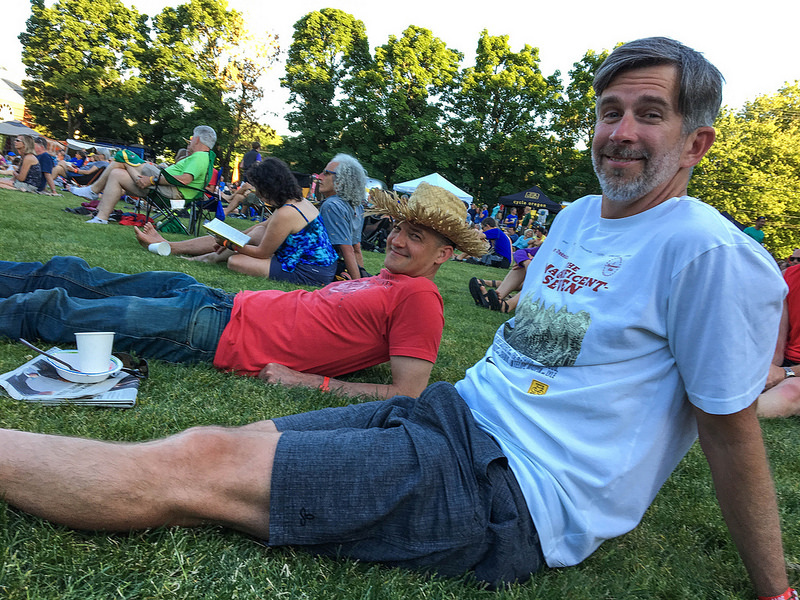 “WEEKENDER has been a Cycle Oregon staple since 2004, hosting the event for tens of thousands of cyclists over the years all throughout the Willamette Valley. Offering daily routes for every level of cyclist, it’s been home to every age group and ability, providing activities and amenities for both young and old, and it’s important to us to continue to offer an event for such a broad audience. However, over the last number of years attendance of the WEEKENDER has decreased annually. Accordingly, Cycle Oregon has decided to re-examine the event and its operational model. We want to create a way to incorporate some of the ideas its long-time riders have provided, strengthen the event from all angles, and bring it back positioned for the next decade. The format of an all levels inclusive event won’t be changing; this is one of the finest parts of this Cycle Oregon offering and something we’re very proud of. We look forward to bringing WEEKENDER back to the Cycle Oregon line of events in the future. The Weekender is a great event that offers much of the appeal of the Classic ride but in a form that makes it more accessible to families and people who can’t block out a week in September and/or can’t afford the registration fee ($999). In 2015 we noted how it was one of the very few major organized bike rides where women outnumbered the men. Originally conceived as a family-oriented event, in past years it’s also become a perfect place to hang out for a few days with your riding buddies. In other Cycle Oregon news, the big 2019 route unveiling and kickoff party is January 30th at the Portland Art Museum. The first 500 people in the door will get the honor of early registration and be entered into the drawing for a “Golden Ticket” — an all-access free pass to the 2019 Classic Ride. And if you’re looking forward to Cycle Oregon’s Gravel or Joyride events, mark your calendars for May 17th-19th and June 22nd respectively. This year’s Classic will run from September 7th to 14th. The post Cycle Oregon puts ‘Weekender’ event on hold appeared first on BikePortland.org. Tom “TomCat” Martin has taken over the shop formerly known as WTF Bikes. WTF opened in 2009 and its owner Tom Daly sold to Martin last fall. Martin is a bike industry and bike shop veteran (formerly of The e-Bike Store), but this is his first time running his own shop. During a visit in November, he told me the plan is to focus on service, entry-level commuter bikes, and rental for big events like Pedalpalooza and the Portland Winter Light Festival. Martin is also a Burning Man veteran, so if you need a “Playa bike,” TomCat is the place to go. Check out TomCatBikes.com.